Hello got the teams up and running. 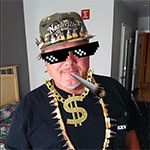 I'm Gobbler aka Doug from Plant city FL. I look forward to hunting with ya'll and teaching the meatslackers there is other ways to kill turkeys without corn and a blind. Southern Sportsman aka Adam from West, TN. Can't wait to get started. I'll be hunting here in the Volunteer state and plan to make a trip to Nebraska in May as well, so maybe I can contribute. Great Im hunting in Florida Georgia and going to Nebraska also. We should do alright. What part of Nebraska you heading to? This will be my first trip to hunt cornhusker gobblers. A buddy of mine has a private land hook up around the Niobrara River. I am hunting on the Niobrara last week in April near Valentine. Small world . Jason from Pa. I will be hunting Pa public land ,Kansas public land, and possibly Hawaii. Bigspur aka Dave from central Fl checking in.I'll be hunting in FL,GA and Nebraska too.I'm looking forward to the start of the 2014 turkey season. Hello, name is Ron and I am from ohio. be hunting ohio Kansas Kentucky and maybe somewhere else. All right. we got five members now. Welcome Ron.